I don’t often wear lipstick but when I do it’s mainly in Winter and through the festive period. I absolutely love darker shades of lipstick and lipgloss. Today I wanted to share my favourite shades that are perfect for this time of year! Maybelline Color Stay 24hr lipgloss in shade Red Passion. This is possibly the loveliest shade for Christmas, no? Perfect for Christmas day or a work Christmas party. I love this double ended product with red gloss wand at one end and conditioning balm at the other. Bourjois Rouge Edition lipstick in Violine Strass. I’ve only swatched this once as I received it a few weeks ago but I already love it. This is a gorgeous purple-red shade with an opaque glossy finish. It’s buildable and glides on like a balm. Nuxe Reve de Meil lip balm. 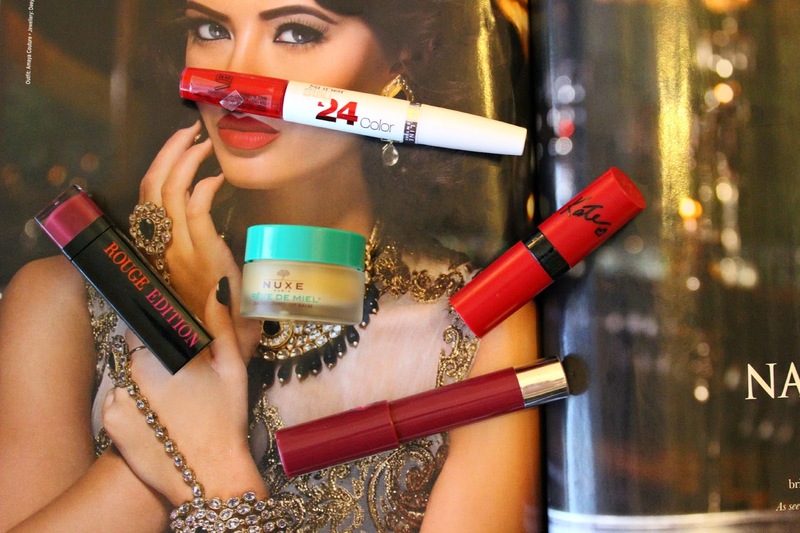 I couldn’t do a winter lipsticks post without mentioning one of my favourite lip balms. Because we all know we can’t wear a good lipstick without prepping our lips with balm beforehand. This balm is so thick and nourishing, it’s full of goodies to sooth your lips like honey and grapefruit so no more chapped lips! Rimmel Kate Moss in shade 107. 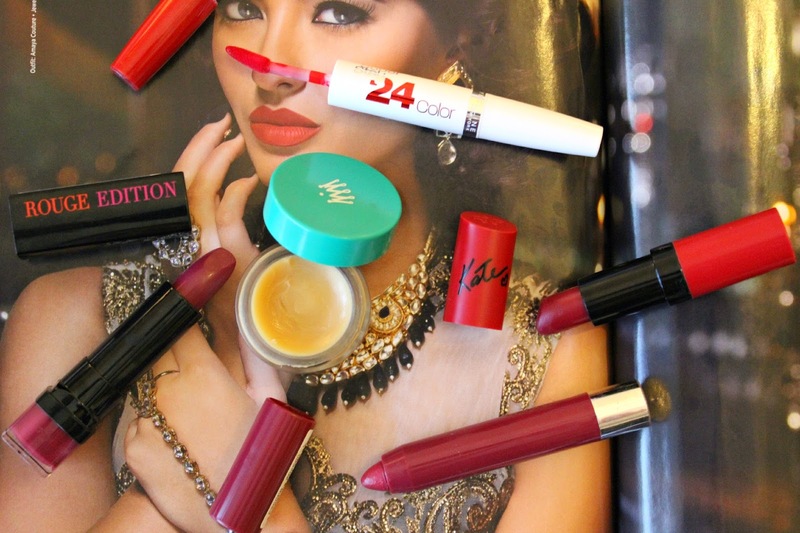 This holy grail bargain lipstick doesn’t need much of an introduction for bloggers reading. A gorgeous deep red and matte finish. It’s a show stopper and really does look good from day to night. MUA Power Pouts Lip Crayon in shade Crazy in Love. I love this simply because it’s buildable. It’s perfect as just a little cover for during the day/at work then build up in the evening for an extra pop of colour. It has a wonderful glossy finish and doesn’t dry out my lips at all and it has a lovely mint taste to plump up the lips. What do you think of these Winter shades? Do you dare to go darker during the colder months? The Nuxe lip balm is always on my bedside table, such a holy-grail product for me! Haven’t tried much MUA makeup, but that lip crayon looks gorgeous!